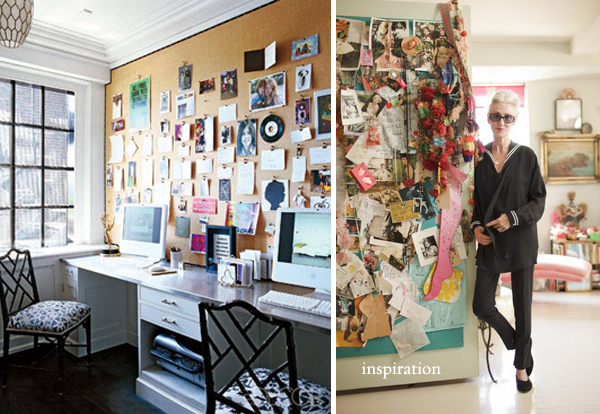 Do you keep a pinboard / inspiration offline? I just tore down all the content off of my inspiration boards in my office (which I do about every season) and am rethinking what I want to put on them this go around. I've always been kind of obsessed with looking at various cool inspiration boards, and came across these two that I really love. Now to decide whether to go more orderly, or more messy! What is your flavor? 1: Elle Decor - Ellen Rakieten's space. 2: Refinery 23 - Linda Rodin's space. I love pin boards!! I have two large ones in my office, so whenever I see something in a magazine I can rip it out and pin it up! Inspiration boards are so much fun to do! Love them both! I'm tempted to get one made like the first picture! i love my inspiration board!! Use to be messy but now orderly! We're building a new house and I can't wait for my new craft room! YAY! I can finally dedicate a whole wall of inspiration! Happy Friday! Some pictures and remembrance will be a very good thing to consider you can appreciate as an inspiration. It is also good to make a corner where you can appreciate it all. Though I've recently stripped it down, and am yet to re-pin. At 12ft long, it's kinda daunting! Agreed. I love inspiration / mood boards... great post! Thanks for an excellent article! I appreciate your insights and inspiration board. This blog is very unique. I like this way to post this blog. Thank you.